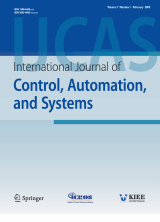 Abstract : "This paper presents a simple and effective design of a discrete-time repetitive control (RC) in frequency domain. Unlike existing phase lead RC designs, the proposed approach provides flexible phase lag compensation at multiple frequencies, which ensures improved tracking performance and robustness against system uncertainties over a wide bandwidth. The proposed design is applied to a linear actuator (LA) with friction and payload variations. The robust stability analysis presented in this study demonstrates the effectiveness of the proposed method in the presence of multiple system uncertainties. Both simulation and experimental results validate the improvement. While, the comparison study shows the superiority of the proposed approach. " Keyword : "Linear actuator (LA), phase lead compensator (PLC), phase lead repetitive control (PLRC), repetitive control (RC). "